The 13 inch MacBOok Pro with four USB-C-Ports: The two ports on the right have reduced PCI Express bandwith. Apple uploaded a new support document detailing information about connectivity and charging options for the MacBook Pro models. According to this document, the 13 inch MacBook Pro model with Touch Bar has reduced PCI Express bandwith on the two USB-C ports on the right side of the device. Apple released more detailed information on their MacBook Pro series in the form of a support document. In it, Apple reveals specifies connectivity and charging options for the two 13 inch MacBook Pro models and the 15 inch MacBook Pro. While the 15 inch MacBook Pro can operate all of its four USB-C ports at full speed, the 13 inch MacBook Pro with Touch Bar that also has four USB-C ports has reduced PCI Express bandwith on its two ports on the right side of the device. This does not apply to the 13 inch MacBook Pro without the Touch Bar does only has two USB-C ports. That is why Apple is recommending to connect high performance devices to the left side of the 13 inch MacBook Pro with Touch Bar. Tests will show how big this bandwith cap really is, Apple did not specify any data on this in the document. 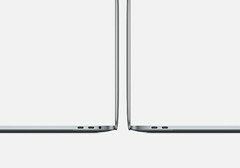 Apple also goes into some detail about the charging options for the MacBook Pro series. While you can connect more than one charging adapter to any of the USB-C ports, the device will only draw power from one adapter delivering the most power. You can connect chargers delivering up to 100 Watt to the MacBook Pro. If you charge through the USB-C VGA Multiport Adapter or the USB-C Digital AV Multiport Adapter, only 60 Watt of power gets delivered to the device resulting in slower charging speeds on the 15 inch MacBook Pro.